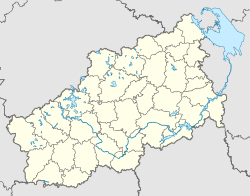 Tver (Russian: Тверь, IPA: [tvʲerʲ]) is a city and the administrative centre of Tver Oblast, Russia. Population: 414,606 (2015 est. ); 403,606 (2010 Census); 408,903 (2002 Census); 450,941 (1989 Census). Located 180 kilometres (110 mi) northwest of Moscow, Tver was formerly the capital of a powerful medieval state and a model provincial town in the Russian Empire, with a population of 60,000 on 14 January 1913. It is situated at the confluence of the Volga and Tvertsa Rivers. The city was known as Kalinin (Кали́нин) from 1931 to 1990. The city is where three rivers meet, splitting the town into northern and southern parts by the Volga River, and divided again into quarters by the Tvertsa River, which splits the left (northern) bank into east and west halves, and the Tmaka River which does the same along the southern bank. Tver's foundation year is officially accepted to be 1135, although there is no universal agreement on this date and some estimates place it as late as the second half of the 13th century. The name of the city is of Finnish origin, Tiheverä. Originally a minor settlement of Novgorodian traders, it passed to the Grand Prince of Vladimir in 1209. In 1246, Alexander Nevsky granted it to his younger brother Yaroslav Yaroslavich (d. 1271), from whom a dynasty of local princes descended. Four of them were killed by the Golden Horde and were proclaimed saints by the Russian Orthodox church. Formerly a land of woods and bogs, the Principality of Tver was quickly transformed into one of the richest and most populous Russian states. As the area was hardly accessible for Tatar raids, there was a great influx of population from the recently devastated south. By the end of the century, it was ready to vie with Moscow for supremacy in Russia. Both Tver and Moscow were young cities, so the outcome of their rivalry was far from being certain. Mikhail, the Grand Prince of Tver, who ascended the throne of Vladimir in 1305, was one of the most beloved of medieval Russian rulers. His policy of open conflict with the Golden Horde led to his assassination there in 1318. His son Dmitry "the Terrible Eyes" succeeded him, and, concluding an alliance with the mighty Grand Duchy of Lithuania, managed to raise Tver's prestige even higher. Exasperated by Dmitry's influence, Prince Ivan Kalita of the Grand Duchy of Moscow engineered his murder by the Mongols in 1326. On hearing the news of this crime, the city revolted against the Horde. The Horde joined its forces with Muscovites and brutally repressed the rebellion. Many citizens were killed, enslaved or deported. This was the fatal blow to Tver's aspirations for supremacy in Russia. In the second half of the 14th century, Tver was further weakened by dynastic struggles between its princes. Two senior branches of the ruling house, those of Kashin and Kholmsky, asserted their claims to the grand ducal throne. The claimers were backed up by Moscow and eventually settled at the Moscow Kremlin court. During the Great Feudal War in the Grand Duchy of Moscow, Tver once again rose to prominence and concluded defensive alliances with Lithuania, Novgorod, Byzantium, and the Golden Horde. Grand Prince Boris of Tver sent one of his men, Afanasy Nikitin, to search for gold and diamonds as far as India. Nikitin's travelogue, describing his journey from 1466 to 1472, is probably the first ever firsthand account of India by a European. A monument to Nikitin was opened on the Volga embankment in 1955. On 12 September 1485, the forces of Ivan the Great seized the city. The principality was given as an appanage to Ivan's grandson, only to be abolished several decades later. Last scions of the ruling dynasty were executed by Ivan the Terrible during the Oprichnina. At that turbulent time, Tver was ruled by Simeon Bekbulatovich, a former khan of Kasimov. The only remnant of his ephemeral reign is a graceful tent-like church in the village of Kushalino, 28 kilometers (17 mi) northeast of Tver. The city's decline was not irrevocable, however. With the foundation of St. Petersburg, Tver gained importance as a principal station on the highway (and later railway) en route from Moscow. It was much visited by Russian royalty and nobility traveling from the old capital to the new one and back. In the course of the administrative reform carried out in 1708 by Peter the Great, Tver was included into Ingermanlandia Governorate (since 1710 known as Saint Petersburg Governorate). In 1727 it was transferred to the newly established Novgorod Governorate. In 1775, Tver Viceroyalty was formed from the lands which previously belonged to Moscow and Novgorod Governorates, and the whole area was transferred to Tver Viceroyalty, which in 1796 was transformed to Tver Governorate. Tver was the center of Tverskoy Uyezd. Following a devastating fire of 1763, the city was rebuilt in a Neoclassical style. Under Catherine the Great, the central part was thoroughly reconstructed. Crumbling medieval buildings were razed and replaced with imposing Neoclassical structures. The most important of these are the Travel Palace of the Empress (designed by the celebrated Matvei Kazakov), and the Ascension church (designed by Prince Lvov and consecrated in 1813). In 1809 a committee was set up on the improvement of the city, where he worked the famous architect of the capital Rossi. His projects include Cathedral of Christ, and houses on the waterfront and city center (a total of 30 buildings). He also rebuilt Travel Palace. At this time, in the city lived a sister of Alexander I, Catherine Pavlovna, who was married to the governor of Tver, which turned the Palace into one of the centers of social life of the country and fashionable literary salon, where going to the high society of Tver and which was visited by many prominent people from Moscow and St. Petersburg. Writer and historian Nikolay Karamzin read here Emperor Alexander excerpts from his "History". In the palace of the Prince of Persia took Khozrev Mirza, who came to apologize for the killing of Alexander Griboyedov, met the Prussian King Frederick William III. Additional quarters for himself and his family to settle in the palace of the Tver Alexander II. On 12 July 1929, the governorates and uyezds were abolished. Tverskoy District, with the administrative centre in Tver, was established within Tver Okrug of Moscow Oblast. On 23 July 1930, the okrugs were abolished, and the districts were directly subordinated to the oblast. On 20 November 1931, the city was renamed Kalinin after the nominal head of state (1919–1946) and affiliate of Josef Stalin, Mikhail Kalinin, who had been born nearby. Simultaneously, Tverskoy District was renamed Kalininsky District. On 29 January 1935 Kalinin Oblast was established, and Kalininsky District was transferred to Kalinin Oblast. The last vestige of the pre-Petrine epoch, the Savior Cathedral, was blown up in 1936. In 1940, the NKVD executed more than 6,200 Polish policemen and prisoners of war from Ostashkov camp. The Wehrmacht occupied Kalinin for two months from Tuesday, 14 October to 19 December 1941, leaving the city in ashes. Kalinin was the first major city in Europe to be liberated from the Wehrmacht. During the Cold War, Kalinin was home to the Kryuchkovo air base, which is no longer in service. The city's historic name of Tver was restored on 17 July 1990. Apart from the suburban White Trinity Church (1564) (Russian: Храм Троицы Живоначальной, the Temple of the Lifegiving Trinity), there are no ancient monuments left in Tver. The central part is graced with Catharinian and Soviet edifices, bridges, and embankments. Tver's most notable industries are a railroad car plant, opened in 1898, an excavator factory, and a glass factory. Tver is home to Migalovo, which is one of Russia's biggest military airlift facilities. Tver is the administrative centre of the oblast and, within the framework of administrative divisions, it also serves as the administrative centre of Kalininsky District, even though it is not a part of it. As an administrative division, it is incorporated separately as Tver Okrug, an administrative unit with a status equal to that of the districts. As a municipal division, Tver Okrug is incorporated as Tver Urban Okrug. Proletarsky City District – west part of the city, named after the Proletarka plant. Tsentralny City District – central part of the city including historical downtown and neighbourhood in a near proximity. The Tver City Duma, the local parliament is composed of 33 deputies. The executive branch is the Administration of Tver. The structure consists of the head of administration of the city administration (since 2012 – Valery Pavlov), his deputies, industry bodies (departments of architecture and construction, housing and communal services, health and social policy, property management and land resources; economy, investment and industrial policy, a number of departments and divisions), as well as the administration of the four districts: Zavolzhsky, Moscow, Proletarsky and Tsentralny. A considerable part of the government buildings of the city of Tver and the Tver Oblast lay along Sovietskaya Street: the Soviet area (Sovietskaya 44) is the residence of the Governor of the Oblast, and a former Regional Party Committee (Sovietskaya 33) is The Legislative Assembly of Tver Oblast. Tver City Duma as a representative body of the city existed from 1785 to 1918, was reconstituted after the dissolution of councils and adoption of the new Constitution of Russia in 1993. On 20 March 1994, elections were held in the House of Representatives, who on 26 May was called Tver City Duma. 7 June deputies were able to hold the first meeting of the entitled, and on 14 June elect a chairman Valery Matitsyna (later occupied this position Valery Pavlov, Victor Pochtarev Dmitry Bazhenov, Igor Serdyuk, Andrei Borisenko, Lyudmila Polosina Vladimir Babichev). In 1996, deputies took the founding document of the city – the Charter of the city of Tver, putting him in the Duma elections portion by rotation, then the election of deputies held 27 October 1996 and in the future – every two years on the "even" and "odd" districts. In 2007, twelve former deputies (including the former chairman of the Duma Pochtareva) were convicted of taking bribes for decisions in favor Rosvodokanal and other utilities. In October 2008, the deputies of the elections have already passed on party lists, and in March 2009 on the system of party lists have been translated the entire composition of the City Duma, while discontinued the practice of “rotation” of Deputies (the Duma election in parts). In the elections of 2009, the best results (49 per cent of the vote) showed local communists. 27 October 1996 simultaneously with elections to the City Duma passed the first general elections of the head of the city, they defeated Alexander Belousov, who led the 1991 municipal administration and received more than fifty per cent of the vote. On 30 October 2000 he was reelected to a second term, and 9 April 2003 he died of a heart attack. On 26 July 2001 in early Mayoral elections opposition candidate Oleg Lebedev won. On 2 December 2007 when he supported the pro-government party United Russia, he was re-elected for a second term, receiving more than 70 per cent of the vote. On 11 April 2008 he was suspended by the Central District Court in connection with a criminal case opened in 2005, closed in 2006 and renewed the Prosecutor General of Russia in March 2008 (Lebedev was accused of hindering the work of the investigation in against his deputy Oleg Kudryashov). On 2 May Oleg Lebedev was reinstated, and on 3 June, again dismissed, 25 June, he was taken into custody and transported to Kashin, where he was convicted of visiting college Tver Regional Court jury to eighteen years’ imprisonment, which automatically meant the termination of his powers. In 2009, he was released on parole, but the position was not restored. In late 2008, Tver City Duma adopted amendments to the charter of the city, under which direct elections of the Mayor were abolished and a new position of head of the city administration introduced. This amendment to the charter of the city was met with a mixed public reaction and local attempts to bring the issue by the Communists to citywide referendum were not supported by City Duma. In March 2009, the new mayor (now ceremonial post) Vladimir Babichev who had served in the national parliament for United Russia, and in May the same year, Toloko Basil was appointed the head of the city administration. He had previously been the first deputy governor of the Tver Oblast. The mayor and the head of the local administration were elected with a thin majority of seventeen votes (United Russia, Fair Russia and the Liberal Democratic Party) against sixteen (Communist Party). On 27 December 2011 by a majority vote (22 for, six against) City Council voted in favor of early termination of Basil Toloko. On 29 March 2012 the Tver City Duma (25 for, 4 against) appointed Valery Pavlov to the post of Head of the Administration. He had previously held the post of the first deputy chief of staff. Tver is home to Tver State University, the highest rated university in the region. It is also home to the Tver State technical university, medical university, agricultural academy, and more than twenty colleges and lyceums, branch campuses of some Moscow higher educational institutions and more than fifty high schools. The Tver State Medical Academy is located in Tver. The Tver Branch of MESI. Moscow State University of Economics, Statistics, and Informatics – a university with more than 75 years of history. Tver also houses the Zhukov Air and Space Defense Academy. Tver also has around fifty secondary schools, a private school (lycee), and the Suvorov military school. Tver railway depot and roundhouse, ca. 1860. Photo courtesy SMU. The Oktyabrskaya Railway linking Moscow and St. Petersburg crosses the city. 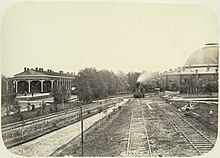 Since 1850, there has been a railway connection between Tver and Moscow. The primary Tver' Railway Station has a locomotive and car shed, allowing it to service both passenger and cargo trains. In addition to the Tver' Central Station, there are four minor stations within the city perimeter: Lazurnaya, Proletarskaya, Doroshikha and PPGT. The suburban railway service links Tver to Moscow, Bologoye, Torzhok. Most trains passing from Moscow to the north-west regions make a short stop in Tver'. The high-speed train Sapsan, which connects Moscow with St Peterburg, also makes stops in Tver, as well as the Tolstoy train connecting Moscow to Helsinki, Finland. The newly designed high-speed railway line between Moscow and St Peterburg is expected to have "New Tver'" station several kilometers southward of the city border. The narrow gauge railway of KSM-2 factory, Tver plant of building materials No.2. The major M10 Highway linking Moscow and St. Petersburg also crosses the city. This motorway is a part of the Pan-European corridors system. The roads to Rzhev (A112), Vesyegonsk (P84) and Volokolamsk (P90), along with many smaller regional roads, originate in the city. The new highway between Moscow and St. Petersburg, that is designed at the present time, will pass close to the northern border of Tver. Tver is notable by a pretty high number of private cars: there are 288 cars per thousand residents, which is well above average among the other regions of Russia. There is a local bus station that interconnects Tver' with minor towns of Tver Oblast, neighboring oblasts, and Moscow. Local public transit consists of trolleybuses, trams, buses, and marshrutkas (routed taxis). The latter two have taken priority during recent years. There are two airfields within the city: Migalovo military air base and Zmeyevo airport; although the nearest airport with regular scheduled commercial service is Sheremetyevo airport in Moscow. The river station (речной вокзал) is on the left bank of the Volga River, close to the confluence with the river Tvertsa. There is also a small cargo port in the lower part of the Volga. During the summertime, pleasure boats ply up and down the Volga, with their base off the river station. The Zvezda Cinema (1937) was the largest in Tver Oblast for a long time. The city association football team, FC Volga Tver, was dissolved in 2017. Tver has a humid continental climate, which is typical for Central Russia. Winters are long, snowy and cold, but extremely severe frosts (below −35 °C (−31 °F)) are rare, less than 10 calendar days per annum. The summer is generally warm and humid, with the temperature often rising higher than +30 °C (86 °F). Tver has four functioning Russian Orthodox cathedrals, fifteen Orthodox churches, a Mormon chapel, a Catholic church, a mosque, and a synagogue. Within Tver, as in other cities of Central Russia the main religion is Russian Orthodox Christianity. Tver is the center of Diocese of Tver and Kashin of the Russian Orthodox Church, having the diocesan administration and residence of the ruling bishop. Since December 4, 1988 the Archbishop of Tver and Kashin has been Metropolitan Victor (Oleynik). White Trinity Temple in Zatmache, recently renamed Trinity Cathedral, built in 1564 and since repeatedly reconstructed, is the oldest surviving stone buildings in Tver. It is subordinate to the ruling bishop. Ascension Cathedral, built in the 1750s, is in the historic center of the city on Tverskaya Avenue and has the status of an episcopal monastery. Preserved Assumption Cathedral 18th century pre-existing Otroch monastery is in Trans-Volga district, near the mouth of Tvertsa river. Resurrection Cathedral was built in 1912–1913, marking the 300th anniversary of the Romanov dynasty, and in the 1990s, after the return of the church, received the status of the cathedral and is directly subordinate to the ruling bishop. Not far from the cathedral is the Cathedral of the Nativity of Christ and the monastery, built in the 1810s. ^ a b Государственный комитет Российской Федерации по статистике. Комитет Российской Федерации по стандартизации, метрологии и сертификации. №ОК 019-95 1 января 1997 г. «Общероссийский классификатор объектов административно-территориального деления. Код 28 220», в ред. изменения №278/2015 от 1 января 2016 г.. (State Statistics Committee of the Russian Federation. Committee of the Russian Federation on Standardization, Metrology, and Certification. #OK 019-95 January 1, 1997 Russian Classification of Objects of Administrative Division (OKATO). Code 28 220, as amended by the Amendment #278/2015 of January 1, 2016. ). ^ Численность населения по муниципальным образованиям (in Russian). Тверьстат. Retrieved July 28, 2015. ^ Fritz Rudolf Künker GmbH & Co. KG. Diocese of Tver. Künker Auktion 130 - The De Wit Collection of Medieval Coins, 1000 Years of European Coinage, Part II: Germany, Switzerland, Austria, Bohemia, Moravia, Hungary, Silesia, Poland, Baltic States, Russia and the golden Horde. "Numismatischer Verlag Künker". ^ Малыгин, П. Д.; Смирнов, С. Н. (2007). История административно-территориального деления Тверской Области (PDF). Tver. p. 13. OCLC 540329541. ^ Справка об изменениях в административно-территориальном делении Тверской губернии – Калининской области (in Russian). Архивы России. Archived from the original on October 25, 2012. Retrieved March 29, 2014. ^ "Train Station in Tver" (in Russian). Archived from the original on March 13, 2016. Retrieved March 29, 2018. ^ "Триллион "Сапсана"". July 7, 2010. Retrieved March 29, 2018. ^ "РБК 500: Крупнейшие компании России". Retrieved March 29, 2018. ^ "Weather and Climate-The Climate of Tver" (in Russian). Weather and Climate (Погода и климат). Retrieved April 6, 2016. ^ "Comune di Bergamo (BG)". www.comune.bergamo.it. Retrieved March 29, 2018. Тверская городская Дума. Решение №137 (358) от 13 декабря 2012 г. «Об утверждении гимна города Твери». Вступил в силу со дня официального опубликования. Опубликован: "Вся Тверь", №14, 20 декабря 2012 г. (Tver City Duma. Decision #137 (358) of December 13, 2012 On the Adoption of the Anthem of the City of Tver. Effective as of the day of official publication.). Законодательное Собрание Тверской области. Закон №34-ЗО от 17 апреля 2006 г. «Об административно-территориальном устройстве Тверской области», в ред. Закона №66-ЗО от 1 октября 2014 г. «О внесении изменения в статью 18 Закона Тверской области "Об административно-территориальном устройстве Тверской области"». Вступил в силу со дня официального опубликования. Опубликован: "Тверские ведомости", №17 (специальный выпуск), 19 апреля 2006 г. (Legislative Assembly of Tver Oblast. Law #34-ZO of April 17, 2006 On the Administrative-Territorial Structure of Tver Oblast, as amended by the Law #66-ZO of October 1, 2014 On Amending Article 18 of the Law of Tver Oblast "On the Administrative-Territorial Structure of Tver Oblast". Effective as of the official publication date.). Законодательное Собрание Тверской области. Закон №4-ЗО от 18 января 2005 г. «Об установлении границ муниципальных образований Тверской области и наделении их статусом городских округов, муниципальных районов», в ред. Закона №65-ЗО от 24 июля 2012 г. «О внесении изменения в статью 2 Закона Тверской области "Об установлении границ муниципальных образований Тверской области и наделении их статусом городских округов, муниципальных районов"». Вступил в силу через десять дней после официального опубликования. Опубликован: "Тверские ведомости", №3, 21–27 января 2005 г. (Legislative Assembly of Tver Oblast. Law #4-ZO of January 18, 2005 On Establishing the Borders of the Municipal Formations of Tver Oblast and on Granting Them the Status of Urban Okrugs, Municipal Districts, as amended by the Law #65-ZO of July 24, 2012 On Amending Article 2 of the Law of Tver Oblast "On Establishing the Borders of the Municipal Formations of Tver Oblast and on Granting Them the Status of Urban Okrugs, Municipal Districts". Effective as of the day which is ten days after the official publication.). Президиум Верховного Совета РСФСР. Указ от 17 июля 1990 г. «О переименовании города Калинина в город Тверь». Опубликован: "Ведомости СНД РСФСР и ВС РСФСР", №8, ст. 117, 1990 g. (Presidium of the Supreme Soviet of the RSFSR. Decree of July 17, 1990 On Changing the Name of the City of Kalinin to the City of Tver. ). Annette M. B. Meakin (1906). "Tver". Russia, Travels and Studies. London: Hurst and Blackett. OCLC 3664651.